We have been busy taking and organizing photos and scheduling our feed on Instagram. If you have an Instagram account, please be sure to Follow Us - we will follow you back. 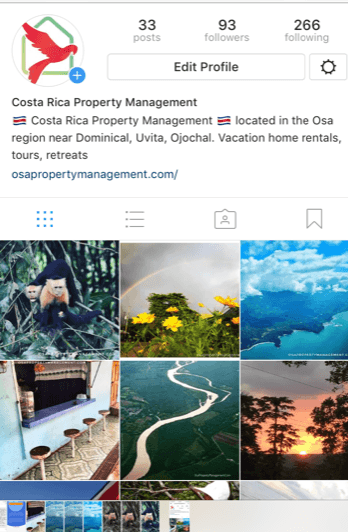 Here's the link to our account (a new page will open) or merely open Instagram on your mobile device, go to the bottom and click on the magnifying glass, then start typing "Osa Property Management" - our account should appear at the top. We love Instagram as a primary way to share the beauty of all Costa Rica has to offer. There are days we may publish five or more photos, depending on what catches our collective eyes or what our clients are sharing with us. You may have also noticed that we have included an Instagram feed on the right side of our website. We added that especially for those who don't currently have an Instagram account and for those that do have one, it provides a great way to see the type of images we share. We try to keep our Facebook posts to no more than five per week as we don't want to inundate anyone's Facebook account with 'too much' information. However, be sure to Like us on Facebook also for up-to-date news and information about the Osa region of Costa Rica. All of our photos in Instagram were taken by our staff, our guests or provided to us by others to use with their permission. We can show you exactly where the photos were taken if you want to take a tour. Simply pick out the photos you like, and we will line up a tour to see them.